Jo Allen, Ph.D., Meredith College Class of 1980, was named the eighth president of the College on April 18, 2011. Allen, who took office as president on July 1, 2011, is the first Meredith College alumna to assume the leadership of the 123-year old institution, one of the largest private colleges for women in the United States. Allen brings her experience as a faculty member, administrator and scholar to her current role as president of her alma mater. Allen previously served as senior vice president and provost, and professor of English, at Widener University, in Chester, Pa. There she oversaw academic and student affairs on four campuses in two states for approximately 6,500 students and more than 700 full- and part-time faculty. Other leadership positions held by Allen at universities where she taught include special assistant positions for various projects, as well as vice provost and interim vice provost. A North Carolina native, Allen earned her Master’s degree from East Carolina University and her doctorate from Oklahoma State University. Both her M.A. and her Ph.D. were in English literature, with an emphasis in Technical and Professional Communication. Her B.A. from Meredith was also in English. She served as tenured associate professor of English at East Carolina University and tenured associate professor at North Carolina State University. Maureen A. Hartford served as the seventh president of Meredith from 1999-2011, and was the first woman assume the leadership of the College. During her tenure, Hartford led efforts to strengthen academic offerings, expand and enhance campus facilities, improve the diversity of the student body, and increase the College's endowment. Hartford established the addition of the Master of Arts in Teaching degree, Master of Science in Nutrition degree, and engineering dual-degree program with North Carolina State University. She oversaw the largest fundraising campaign in the College’s history, The Campaign for Meredith, and increased the endowment by more than $35 million. Hartford was a champion for study abroad. During her presidency, the College opened its permanent location in Sansepolcro, Italy, and the number of students participating in study abroad increased from 7 percent to 31 percent. Hartford came to Meredith with more than 30 years of experience in higher education. Prior to her arrival, Hartford was vice president for student affairs at the University of Michigan. A native of Charlotte, N.C., she holds a Bachelor of Arts in French and a Master of Arts in College Teaching at the University of North Carolina in Chapel Hill. Her doctorate in higher education administration is from the University of Arkansas. John E. Weems was appointed Meredith’s sixth president and served with distinction for 27 years. During Weems’ presidency, the College nearly doubled its enrollment, increased the number of full-time faculty, and grew the endowment from $887,000 to nearly $50 million. Weems’ tenure established a greater emphasis on quality of instruction and facilities at the College. The percentage of faculty doctorates rose from 40 percent to 82 percent. He oversaw the increase in size of the physical plant and construction of 12 new facilities on campus. Student experience was important to Weems. Under his leadership, the amount of financial assistance awarded increase, summer study abroad programs began to be offered, and the Lilian Parker Wallace Lecture Series was created. The College also began offering master’s degrees in business, education, and music. Weems is the namesake for Meredith’s graduate school. Before assuming Meredith's presidency, Weems was vice president for finance and administration at Middle Tennessee State University, Murfreesboro, from 1968-71 and dean of administration, 1961-68; dean of admissions and registration at Kentucky Wesleyan College, Owensboro, 1959-61; and dean of students and director of admissions and placement at Atlantic Christian College (now Barton College), Wilson, N.C., 1955-59. E. Bruce Heilman served as Meredith fifth president from 1966-71. 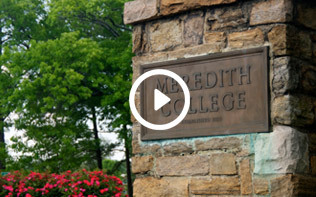 Under his leadership, Meredith College completed a three-year fundraising campaign, raising funds to support the construction of six new buildings. The new additions were Carlyle Campbell Library, Cate Student Center, Weatherspoon Gymnasium, Heilman and Brewer Residence Halls, and the Massey House president’s residence. He also oversaw a restructuring of Johnson Hall, the College’s administration building. Heilman also directed the strengthening of the College’s Board of Trustees, and the establishment of an annual giving fund. Carlyle Campbell served as Meredith’s fourth president from 1939-66. During his tenure, seven permanent buildings had been added to the original six, three replacing wooden structures meant to be temporary when the College moved to its present location. These new buildings were Jones Hall, Joyner Hall, Hunter (now Martin) Hall, Ellen Brewer House, Carroll Health Center, and Poteat Residence Hall. Plans for a new library were underway and numerous improvements were made to the grounds and original building. The enrollment grew from 569 in 1939-40 to 983 in 1966. The faculty grew from 60 to 95, with 13 more part-time instructors. Among Campbell’s other lasting accomplishments was the establishment of the annual Faculty Distinguished Lecture, which was given for the first time in 1964. Charles E. Brewer served as Meredith’s third president from 1915-39. During the course of his 24-year tenure, the College was admitted to the Southern Association of Colleges and Schools, approved by the Association of American Universities, and graduates became eligible for membership in the American Association of University Women. Brewer managed the College’s move from its original location in downtown Raleigh to its current location on Hillsborough Street. Under his leadership, the College survived the Great Depression and went on to prosper. By the time Brewer resigned in 1939, enrollment increased nearly 600 students, the endowment grew from $127,000 to more than $500,000, and the number of faculty and staff more than doubled. Richard Tilman Vann served as Meredith's second president for 15 years. When he assumed the position, the College was faced with a $43,000 debt and had no endowment. During the first years of his presidency, he crafted a letter writing campaign and undertook an intensive travel schedule in order to raise funds, with the belief that small gifts from the many were essential to the young institution. His efforts proved successful. During years of service, enrollment increased from 200 to almost 400 students, the institution's debt was eliminated, and an endowment of $127,000 had been built. Vann is also remembered for writing the words and music to Meredith's "Alma Mater." John C. Blasingame served as the College's first president. During his one-year tenure, Blasingame proved to be an able administrator, bringing initiative, enthusiasm, and vigor to Meredith College (then known as Baptist Female University) during its first year.